This is a great achievement for me and for my referrals. I take a 5% at Adnooka I think so those 150$ are above 3k$ I think. Get unlimited Youtube likes/subs/comments, Facebook likes, fans, twitter followers and much more! I is new, will try to get agrasp of CPA! 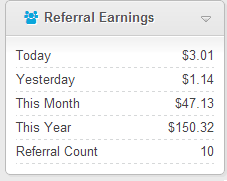 Nice earnings! I signed up with your ref link. Imagine the money you could make if you had 100 referrals! Wow! Nice stats! I wish i could get refs!